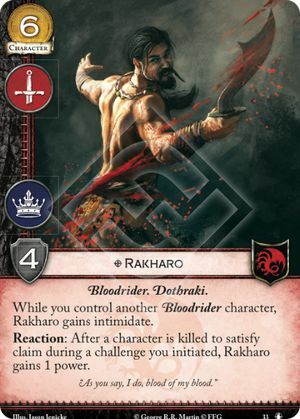 While you control another Bloodrider character, Rakharo gains intimidate. Reaction: After a character is killed to satisfy claim during a challenge you initiated, Rakharo gains 1 power. "As you say, I do, blood of my blood." The Road to Winterfell #33. Can Rhakaro react to a character dying to a claim replacement effect? Yes. Note that when a replacement (indicated by the word "instead") effect is applied, like Seastone Chair (Westeros) or Mirri Maz Duur (Westeros), all it is doing is changing the way whatever it is replacing is resolved. That is to say that "claim" still happens, but instead of working according to the rules in the RR book, it works according to the replacement effect. Here, provided claim happens (it does) and a character dies because of it (in the case of Seastone/Mirri, they will), Rakharo can react and claim a power.